Professor Rachel Williams, a tenured faculty member in the Language Arts Division at West Los Angeles College, is passionate about the arts and education. She has dedicated her time and efforts to promoting students’ global awareness and intellectual and cultural development through major academic and cultural arts enrichment programs that have attracted hundreds of people, not only from the campus community, but also the local and greater Los Angeles communities. Last month, May 14, 2014, at 7p.m. in the Fine Arts Complex at West Los Angeles College, Professor Williams coordinated a spectacular program, “Arts, Sciences and Human Rights: Africa” featuring internationally renowned Kenyan novelist & literary critic, Ngugi Wa Thiong’o and multi-instrumentalist, Bennie Maupin & Ensemble. There were dance performances and a concert by jazz legend Bennie Maupin–an original member of Miles Davis’ troupe–and ensemble. 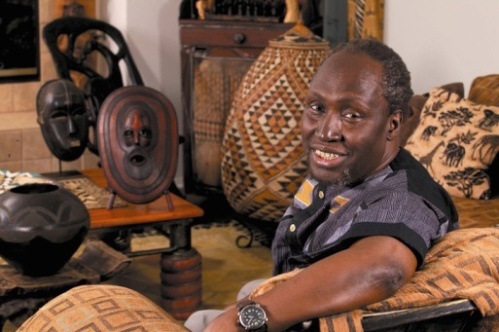 Professor Ngugi Wa Thiong’ o read from his memoir and one of his novels at the post event meet-and-greet. Renowned sculptor, Michael Chukes, unveiled one of his latest sculptures to the audience. There were donations for the prizes for the event drawings from many organizations and individuals. 1st Prize: A Collection of Signed Literary Works by Ngugi Wa Thiong’o, 2nd Prize: A Collection of CDs by Jazz Legend & Multi-Instrumentalist Bennie Maupin, 3rd Prize: Picasso’s L’Amitie (Framed 22×32 inches), 4th Prize: Barnes and Noble Nook Tablet, and 5th Prize: Laithwaite’s Wine Collection (12 Top-Estate Spring Reds and Whites). Sponsors of the event included African American Heritage Month Committee, Los Angeles Community Colleges District Black Faculty & Staff Association, Women’s History Month Committee, Associated Student Organization, and Alpha Gamma Sigma Honor Society. For more information, download the Arts, Sciences and Human Rights Flyer. Renowned poet Wanda Coleman, known as “the L.A. Blueswoman” and “the unofficial poet laureate of Los Angeles. We want to see programming like this at all of the Los Angeles community colleges.